It’s nearing the end of the workweek, so by now you're probably looking forward to some much-needed relaxation. If your weekend plans include chatting with friends over a long brunch, we've got the perfect drink for you--the Passion Fruit Mimosa. Traditional mimosas contain orange juice and champagne, but the juice's acidity can be tough on the stomach and a bottle of bubbly can be tough on the budget. That’s where this week’s Thirsty Thursday recipe comes in. 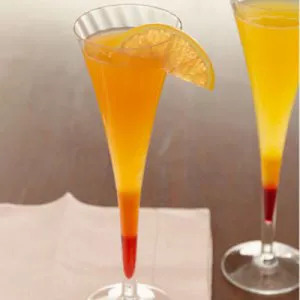 This drink contains prosecco, a dry Italian sparkling wine that tends to be less expensive than champagne, and passion fruit juice, which has the same tangy flavor as orange juice without the acidity. Whether you indulge tonight or wait till the weekend, pour yourself a glass and savor a few minutes of peace and quiet.